A conductivity system measures conductance by means of electronics connected to a sensor immersed in a solution. The analyzer circuitry impresses an alternating voltage on the sensor and measures the size of the resulting signal, which is linearly related to the conductivity. Because conductivity has a large temperature coefficient (as much as 4% per °C -see Fig. 1), an integral temperature sensor incorporated into its circuitry adjusts the reading to a standard temperature, usually 25°C (77°F). Historically, the unit of conductivity measurement has been the "mho/cm" (a mho is the multiplicative inverse of an ohm). A resistivity of 100 ohms x cm is equivalent to a conductivity of 1/100 mho/cm. The mho/cm unit of measurement is now being replaced in industry by an equal and interchangeable international unit called the "Siemen/cm." Conductivity is usually expressed in millionths of a Siemen, that is, in microSiemen/cm. Resistivity is still expressed in terms of Megohm (M?) x cm for high purity water - usually from 0.1 to 20 MΩ x cm. The contacting-type conductivity sensor usually consists of two electrodes, insulated from one another. The electrodes, typically 316 stainlesssteel, titanium-palladium alloy or graphite, are specifically sized and spaced to provide a known "cell constant." Theoretically, a cell constant of 1.0 describes two electrodes, each being one square centimeter in area and spaced one centimeter apart. The electrodeless type of conductivity sensor operates by inducing an alternating current in a closed loop of solution and measuring its magnitude to determine conductivity. The conductivity meter drives Torroid A, which induces the alternating current in the solution. This AC signal flows in a closed loop through the sensor bore and surrounding solution. Torroid B senses the magnitude of the induced current, which is proportional to the conductance of the solution. This signal is processed in the meter to display the corresponding reading. Compact conductivity meters are small enough to fit in your pocket, feature multiple ranges, digital read-outs, and easy to use. Benchtop style conductivity meters designed for lab use, more added features and higher accuracy than pocket meters. Controllers and analyzers for a variety of applications. Ideal for measuring and controlling pH, ORP, and Conductivity/Resistivity. This is the simplest and one of the most widely used applications. Conductivity meter readings are correlated with charts, graphs or previous lab readings to obtain quite accurate and instantaneous values of chemical concentration. In some instances where there is widespread demand for the measurement, special non-linear direct reading meter scales are available. This is true for applications involving the dilution of NaOH, H2SO4 and HCI, among others. Simple to operate, calibrate and maintain. Sensor materials and configurations can easily be tailored to unusual applications. Can be used in a wide range of temperatures and pressures. Enables concentration measurement of any ionizable solute. Not specific (though it can be selective), so it may have many interferences. Temperature dependent, but automatic compensation is a standard feature that normally negates this drawback. Difficulties in this area normally center about the definition (or lack of it) of temperature effects for a given chemical. Once this information is known, the circuit is easily set to correct for it. The various salts and minerals dissolved in natural waters are reasonably uniform in their contribution to conductivity at the concentrations normally encountered. This means that a reading of electrical conductivity meter can be used as an indicator of the total amount of dissolved material in solution. For water taken from a single source, this relationship is quite repeatable and accurate and provides a means of controlling the upper allowable solids limit in industrial heating and cooling systems utilizing re-circulating water. The water is re-circulated for reasons of economy, but if evaporation losses allow solids levels to rise too high, scaling and precipitation of various salts will occur. Conductivity control of the system bleed valve thus allows the user to achieve maximum economy while preventing equipment damage. Cooling towers and boilers are common applications for the measurement, but it may also find use in swimming pools, fountains and other closed water systems. Soluble materials can vary radically in their effect on conductivity. A solution containing 2% acetic acid has a conductivity of slightly less than 1000 umhos. Obviously, acetic acid would not prove to be a serious interference to the measurement of HCI concentration if they were both in solution. Just as obviously, acetic acid concentration could not be measured at all in the presence of an equal (or much lesser) amount of hydrochloric. Even if the HCI were constant, too much resolution is required to see the effect of the acetic. The example is somewhat extreme, and most chemicals are more similar in their conductivities than this. But in many cases, a chemical of interest can be detected in the presence of several other solutes if: (a) the interferences are at relatively constant levels or (b) the chemical of interest possesses a much higher conductivity than other components. Thus NaOH concentrations can be detected in a mix of NaCI and NaOH (if the NaCI does not vary radically) because NaOH is several times more conductive. Most acids and bases are considerably more conductive than their salts because of the tremendous mobilities of hydrogen and hydroxyl ions. An indication of the feasibility of measuring a particular chemical in solution with others can be gained by consulting charts. Conductivities are not directly additive, but they approach this condition closely enough to allow a rough estimate of the conductivity of a mixed solution to be obtained from the sum of the individual conductivities of its components. Barring a chemical reaction between constituents, conductivity of the mix will be somewhat less than the sum of the separate values. In dilute solutions it will be only slightly less. In strong solutions it may drop considerably. This is because increasing concentration in most cases lowers ionic mobilities. A single conductivity meter measurement at a point of interest can be used to detect spills or leaks if they can be expected to provide a significant and unusual change in conductivity. Thus, a probe in a plant effluent channel that normally runs at 10,000 umhos could easily detect a rather small amount of HCI—but it might not see acetic acid at all. In situations where the conductivity of the contaminant is smaller than normal steam fluctuations caused by other factors, a differential measurement with a conductivity sensor can be used. One measurement is taken at a point prior to the location of potential leaks or spills— such as the inlet of a heat exchanger. A second is taken downstream from where contaminant is expected to be introduced—in this case, the outlet of the heat exchanger. The readings are then electrically compared. If they rise and fall together, no action is taken. But, should the outlet rise significantly higher than the inlet, it will indicate that tube penetration has occurred and the cooling stream is being contaminated within the exchanger. The conductivity meter can trigger alarms or actuators to alert an operator or shutdown the system automatically. Two excellent single point applications are the monitoring of boiler return condensate for process contamination and measurement to determine the quality of high purity water (distillation, reverse osmosis, etc.). As previously mentioned, H+ and OH- ions provide a greater increase in conductivity than equal amounts of any other ions. This leads to an interesting and little used property of the measurement (seldom used for industrial control, but it is a common lab technique), that of a titration or neutralization end-point detector. The difficulty in using conductivity to control this reaction of course lies in the fact that, unless you’ve been watching closely, you don’t know which side of neutral you’re on at a given time. Despite this drawback, the approach could still be attractive on applications where physical or chemical conditions are too severe to use a PH electrode. In a system with sufficient retention time, grab samples of pH could enable an operator to add the proper reagent (acid or base) to reach the minimum point. Conductivity cells can be easily constructed from a wide variety of materials and built to conform to almost any physical requirement. 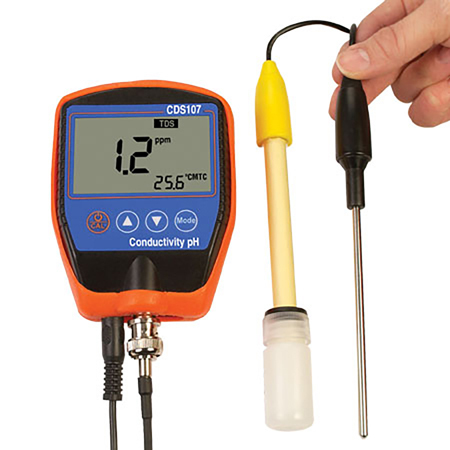 Pressures and temperatures far outside the range of pH equipment can be accommodated— probes with constants of 20.0 have been built for 250 psi, 200°C (400°F) operation.